Easy like a Sunday morning... on Tatooine. 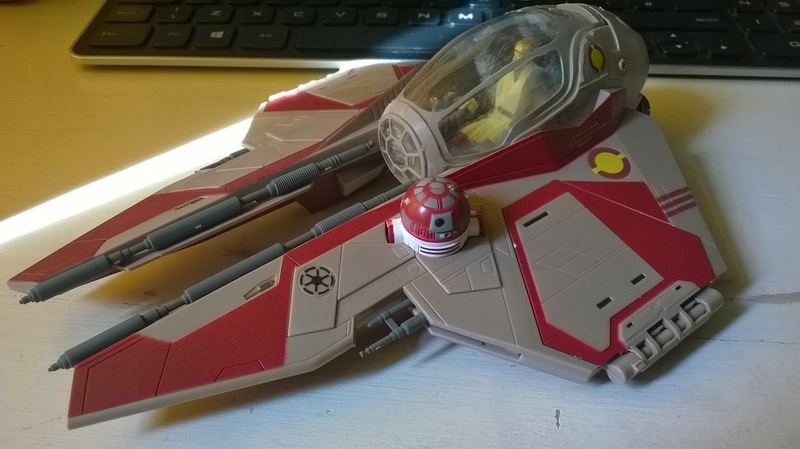 For one of our Christmas Stocking Filler features last year we reviewed Plo Koon's Jedi Starfighter model kit from Revell. We were so impressed by that kit that we couldn't say no when Revell offered to crowd our doormat with a bunch of other Star Wars models from their EasyKit range. A perfect review for the run-up to Star Wars Day (May the fourth (be with you)), and without a dab of paint in sight, we got building. Revell were kind enough to furnish our happy little hands with a few different kits; four from their EasyKit Pocket range and two of the larger EasyKit models. This range is so called because each set will set you back no more than £8-9, with the resulting model fitting comfortably in your pocket. We were sent the Republic Gunship, Obi-Wan's Jedi Starfighter, the Tie Fighter, and the Millennium Falcon. Each kit comes in a well sealed little box and usually contains just two frames of pieces. As with all EasyKits from Revell, all the parts are pre-painted and glue is not required to assemble them. Although using a craft knife to remove the little pieces from the frames is recommended, we found most will just pop off without being damaged; give them a twist and out they will come. The parts then clip and slot together, usually very tightly, to complete the model. 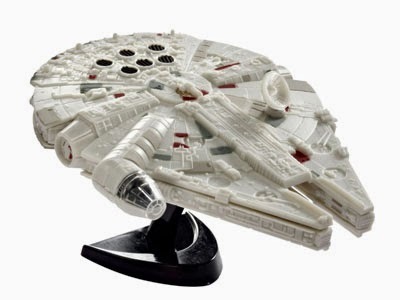 With a kit like the Millennium Falcon you'll have no problem, as all the parts are large and wedge together well. The Republic Gunship however was far more fiddly, containing smaller, thinner pieces that nearly snapped under the pressure of assembly. The ball turrets on either side of the ship, for example, are transparent pieces that fit on the end of very delicate plastic arms. During our time building it one of these arms snapped, meaning we were forced to get out the ol' super glue to fix it. An easy fix it was, but still... beware. 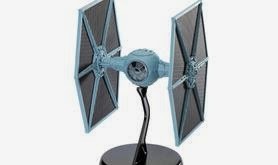 We especially loved the Tie Fighter model and really enjoyed building it. Contained in each of the boxes are black plastic stands for the vehicles to sit on, meaning that once lined up on a shelf the range looks pretty awesome, despite being out of scale. Kudos to Revell for applying so much detail to the kits, not just in the mouldings but also in the pre-paintwork design. All models were really good replicas of the films' spaceships. The bigger boys were what we were really interested in, especially after getting to grips with Plo Koon's ship last Christmas. 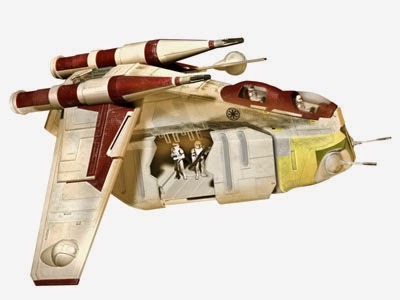 To the same scale as that (although much bigger and more detailed than the EasyKit Pocket version) was Obi Wan's Jedi Starfighter, the ship that first appears in the opening space battle of Episode III: Revenge of the Sith. The build took us the best part of 30 minutes and we found that all the large parts slotted together very well. Detail was great, particularly on Obi-Wan himself who sits in the cockpit. One niggle we did have for this model however, was that unlike Plo Koon before him, Obi Wan is not attached to his seat at all, meaning that if you were building this to play with, your pilot would flop around inside his cockpit. The super glue was called upon once more, just to ensure Obi-Wan stayed put. A minor thing, and if your model will be display-only this won't be problem. 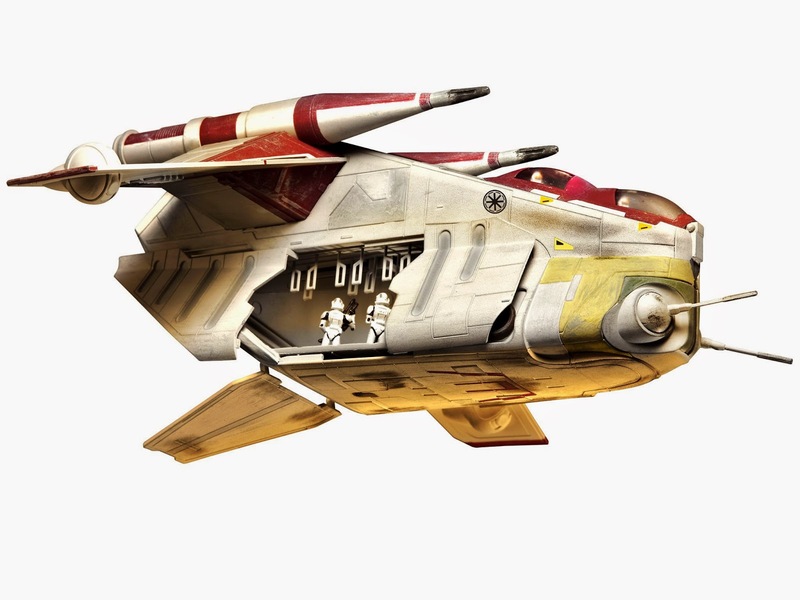 A far tougher and time-consuming build was the Republic Gunship. Unlike it's Pocket range cousin, the full-sized Gunship is firm and hardy and lacks any small delicate pieces. Once assembled the kit is a bit of a monster, and looks incredible on the included stand, especially with the clone troopers standing by the open hatch. 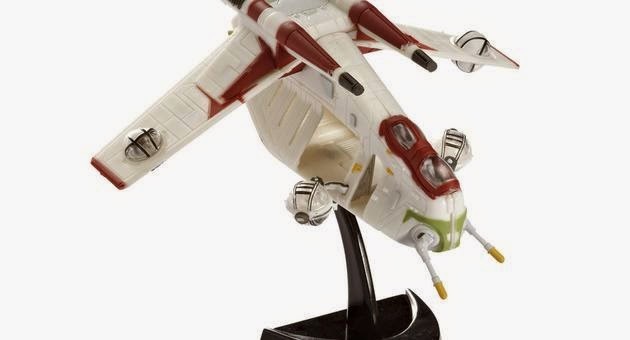 To make the Republic Gunship so strong and playable, Revell have made some allowances that you might not expect. The classic ball turrets (which caused a bit of problem on the Pocket version) are missing here, instead giving the illusion that they have yet to be deployed from the ship. That is a bit of a shame as we would have loved to see a little trooper sitting inside a transparent ball, but clearly Revell have realised that the shape of the ship is firmer without them. Still, a transparent cockpit with pilots showing through is a nice touch, as are the battle-damaged paint details. These are just a small collection of the Star Wars ships available from Revell's EasyKit range, and because a model system that requires no glue or painting will always attract more kids than adults, this is a perfect tie-in. 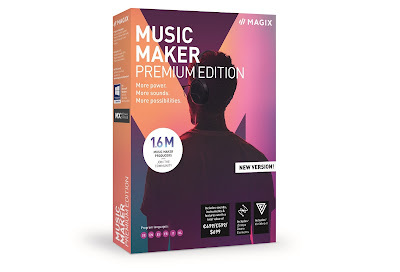 As we said a couple of times, parents should be slightly weary that the model their children are building might not be as robust as they had hoped for without a little dab of glue here and there, but for the most part any model enthusiast should be more than happy. Revell model kits are available from all good toy and model retailers. For details visit www.revell.de/en, on Twitter @RevellGermany, or on facebook.com/revell.